Download Animal-TRAQs for a free 14 day trial. If you like it, a license can be purchased for $179.00 at the SportsVet WebStore. We are excited to announce the launch of Animal-TRAQs software. A software program designed specifically for analysis of animal activities by those individuals who work with performance dogs, horses and other animals. A software program dedicated to those individuals whose career or lives revolve around the animals. Video analysis is an excellent tool to review and analyze how a dog or horse performs an event. The video can be played back for review and evaluation. Since many of the actions of the event occur at a rate faster than the eye or mind can comprehend, it helps to play the video back in slow motion or stop it, to assess body positioning related to the action. From an instructional standpoint, it can help if notes or diagrams (lines, angles, etc.) can be added to a video screenshot to inform the handler, trainer, rider or owner as to how the body was positioned or performing during the action. Video analysis can also be used by the veterinarian to help diagnose lameness or to help describe abnormal movement of a patient to a client. It is currently underutilized in the animal and veterinary world. To help address this, an easy to use video-analysis software program (Animal-TRAQs) has been developed and designed specifically for use in analyzing animal movement. Has a snap shot tool that can be used to copy the video screen and then paste it into a document. It can also be pasted into many other media for transfer or sending to other interested parties. Can be used to capture video if a camera or other capture device is attached to the computer. 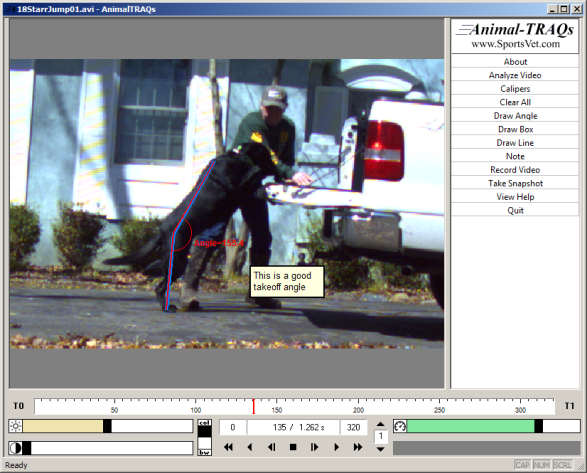 Can save the analyzed video in the Animal-TRAQs format for later viewing, editing or transferring to another user. Will be supported by the Animal-TRAQs developers to help users understand its capabilities. Is a movement analysis software developed by an animal enthusiast for animal enthusiasts. Animal-TRAQs has been designed for anyone who wants to see how an animal moves. Those who work with animals will find it helpful as an analytical tool. The video can be slowed down or stopped at a frame. This lets the viewer visualize actions that occur faster than the eye can capture. The video can be replayed multiple times so the viewer can focus on different areas with each replay. Animal-TRAQs screen view of dog jumping with trainer descriptions. A horse coming to a stop in normal speed as seen in Animal-TRAQs. Slowing down the video play back in Animal-TRAQs, allows the viewer to visualize all of the body’s various movements. Slow Motion playback can help to visualize how the various movements of the body work together to produce activity or movement. A common and noninvasive way to evaluate how an animal is functioning is by Video Analysis. Many actions occur at a speed greater than the human eye is capable of capturing. Using video to analyze an animal’s action allows for us to slow down the action as well as replaying it many times if needed. When viewing an activity at normal speed, many of the body’s actions are hard to view or analyze. When the video is slowed down, the important component actions can be visualized for viewing and analysis. Animal-TRAQS has a selection bar that can slide to slow the video down or speed it up. The stop button can actually stop the video to look at how the body is positioned in relation to an activity. Human sports scientists have long recognized the benefits of understanding the forces and metabolic processes associated with human activity. This led to many products and systems to measure locomotive patterns and metabolic parameters that can be used to evaluate performance. Animals and their activities may be different but their metabolic activity and locomotor actions are somewhat similar. These movement actions can be measured or evaluated to assess how best to train, prepare or rehabilitate the animal for their daily life. In addition, an animal cannot vocalize how they feel and video analysis provides a method to gain much needed information.